Aphrodite Beach Resort Hotel is built in a traditional mykonian style hotel which ensures a shooting and relaxing ambience for their guests, it is also the ideal choice for the guests who decide to visit the cosmopolitan and scenic island of Mykonos. Nestled on the beach, this Mykonos hotel is within 3 mi (5 km) of Kalafatis Beach, Kalo Livadi Beach, and Lia Beach. Monastery of Panagia Tourliani and Monastery of Paleokastro are also within 3 mi (5 km). 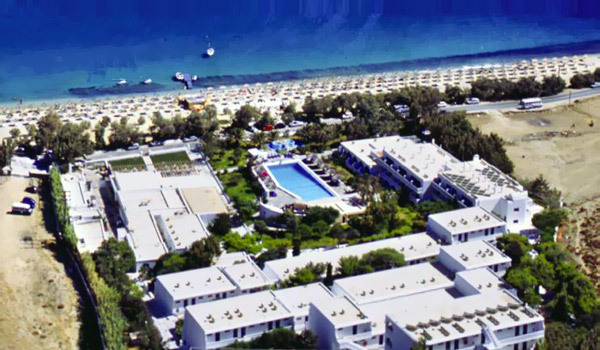 At Aphrodite Beach Resort Hotel, spend the day on the beach where you can enjoy yoga. Then return for a meal at one of the hotel's 2 restaurants. All 148 individually decorated rooms feature free WiFi and balconies. Guests can enjoy deep soaking tubs, and other standard amenities include refrigerators and plasma TVs.